New research led by CU-Boulder/LASP scientist Greg Kopp will advance scientists’ understanding of the contribution of natural versus anthropogenic causes of climate change. The research improves the accuracy of the continuous, 32-year record of the sun’s energy output, which scientists call total solar irradiance (TSI). Energy from the sun is the primary energy input driving Earth’s climate, which scientific consensus indicates has been warming since the Industrial Revolution. The research, which was published in the January 14, 2010, issue of Geophysical Research Letters, supports a lower TSI value than scientists had previously accepted. This new value has been reported by the LASP-built Total Irradiance Monitor (TIM) instrument on the NASA Solar Radiation and Climate Experiment (SORCE) mission; validation tests at a new calibration facility at LASP support the lower TSI value. The ground-based calibration facility enables scientists to validate their instruments against a reference standard calibrated by the National Institute of Standards and Technology (NIST) under conditions similar to on-orbit. Before the development of the calibration facility, solar irradiance instruments frequently returned very different measurements from each other, depending on their calibration. To maintain a long-term record of the sun’s output through time, scientists had to rely on overlapping measurements that allowed them to intercalibrate between instruments. Lean’s model, which is now adjusted to the new lower absolute TSI values, reproduces with high fidelity the TSI variations that TIM observes and indicates that solar irradiance levels during the recent prolonged solar minimum period were likely comparable to levels in past solar minima. 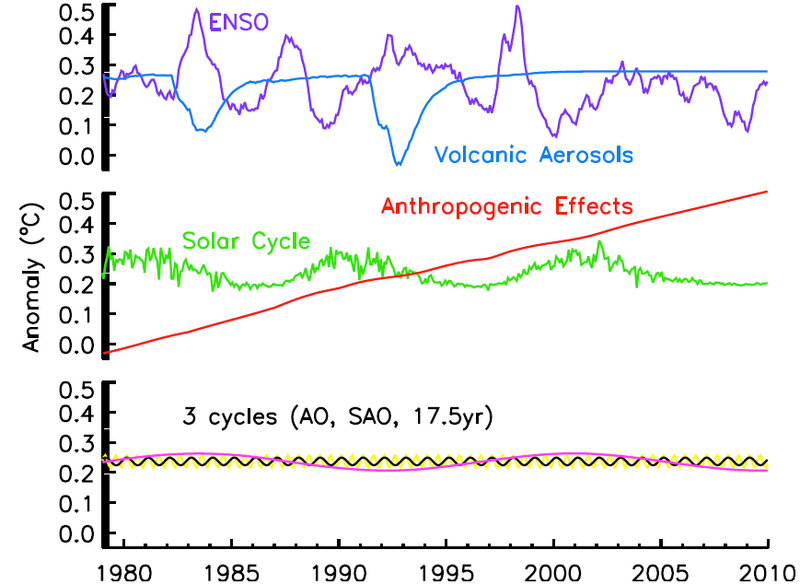 Using this model, Lean estimates that solar variability produces about 0.1°C global warming during the 11-year solar cycle, but is not the main cause of global warming in the past three decades. Kopp, Gregory, and Judith Lean. 2010. A New, Lower Value of Total Solar Irradiance: Evidence and Climate Significance. Jan. 14, 2010. Geophysical Research Letters. AGU.